FaceTite can help to address lax skin in small localised areas. FaceTite is often a good solution where there is saggy skin that requires tightening and contouring, without the need for fat removal. These areas include the eyes, eyebrows, forehead and mouth. The treatment result from FaceTite may last up to about five years, similar to a mini FaceLift. Thereafter the skin will age naturally, though genetics and lifestyle may affect the lifespan of the FaceTite. 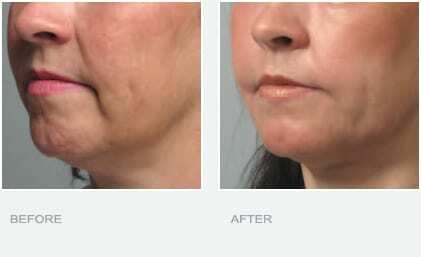 The Forehead, Cheeks, Jowls, Neck, Nasolabial folds (nose to mouth), in fact just about any area above the shoulders can be treated with FaceTite. Local anaesthetic is administered which reduces discomfort to minimal levels. As with BodyTite and NeckTite, FaceTite does not require a general anesthetic which reduces downtime, no overnight stay is required and treatments can be performed within the day. Normally yes, though this would depend upon the skin laxity and your desired results. Depending on your aesthetic concerns Dr. Sagoo, who is well experienced with both treatments, shall assess you in the pre treatment consultation and may recommend to use either treatment in isolation, or both in combination. By avoiding a facelift excision procedure, patients may benefit from reduced post-procedural swelling and discomfort. In general, this is a less traumatic process that may produce a more natural appearance. FaceTite and NeckTite are minimally invasive procedures performed under local anaesthesia or light sedation. Post procedure, you can go home and resume your routine shortly after. Wearing a compression garment is required. To find out if FaceTite is the right treatment for you call us on 0845 603 6150.